Now you can add the Iconic 1969-70 Mach1 interior style to your 1984-93 Fox Body Mustang GT/LX5.0. 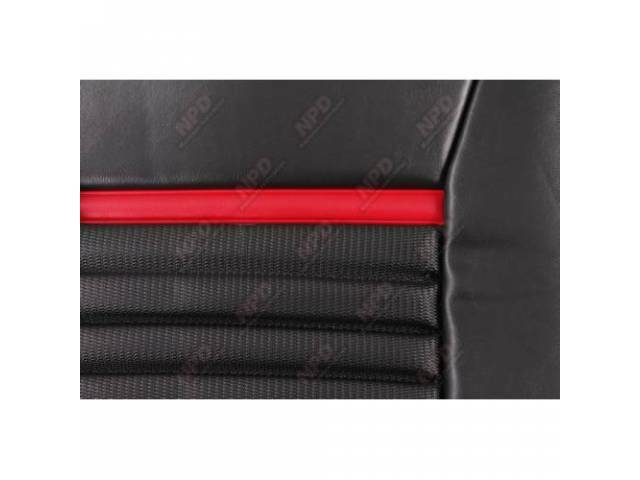 Manufactured in America with original style Sierra Grain Trim and embossed with Comfortweave inserts and the Un-Mistakable Bright Red Mach1 stripe this upholstery is sure to get your Fox Mustang the attention is deserves. This classic look is then carried over into the Rear Seat upholstery that completes the Mach1 mystique front to rear. This Mach1 style upholstery kit is available to fit 1984-86, 1987-89, 1990-91 and 1992-93 GT/LX5.0. THESE MACH 1 SEAT UPHOLSTERY SETS ARE MADE TO ORDER PLEASE ALLOW 4 TO 8 WEEKS FOR DELIVERY. Note: New seat Foam is always recommended when replacing your original seat upholstery. All seat foam for these seats is located on page 12 of the catalog. These seat sets are designed to replace your factory style sport buckets seat.